Last week I found myself missing the spiral notebook. I was reading a few chapters from Natalie Goldberg’s Writing Down the Bones. I was looking for chapters from her book to give to another writer, whom I’m coaching. In the first chapter Goldberg tells her readers to buy a spiral notebook and a pen and to choose these things with care. I don’t know whether more recent editions of this book are out, but if someone were reading that chapter now, they might be a little puzzled. Nowhere in the chapter does she mention using a computer. She assumes that beginning writers will first hand-write their exercises. It reminded me of how different writing by hand is to writing on a computer. It is a much more intimate experience. I read this book when I was about twelve years old. It awakened the inherent urges in me that pushed me towards writing. I immediately started writing in spiral notebooks. I wrote personal essays, thoughts and perceptions, short creative pieces, and poems. When I filled one up, I started writing in another. For several years, this was my writing life. Then I went into my senior year of high school. I was an honor student working to get into college. When I was accepted to Lewis & Clark College, academic life took over. I kept writing short stories, but I stopped writing in notebooks. I packed the notebooks away in storage bins and forgot about them entirely until I picked up Goldberg’s book. Reading that first chapter reminded of the path that brought me here, and I felt reconnected. Those notebooks gave me a safe place to explore, grow, and discover the writer in me. After my senior year of high school, my writing became academic papers and short stories for workshops. Then there was my novel and most recently my blog. But there was always a purpose, and I wrote as a means to an end. That is, until a few weeks ago when I started doing morning pages. I read about the practice in Julia Cameron’s book, The Artist’s Way. It is simply this: three pages of stream of consciousness writing every morning. There is no editing, and you don’t share with others. You write for the sake of writing. This is an amazing practice, and it’s well worth the time. There is a sense of ease in writing without a purpose or an agenda. When I write a piece that I know others will read, I strive to do my best. But morning pages takes off all that pressure and reconnects me with the joy of writing. And while I no longer write in spiral notebooks, I still carry around something with me everywhere in case the mood strikes: a slim, paperback Moleskein and an extra fine point Pilot Precise. Tools that are comfortable and familiar just like Goldberg suggests. Next Post When Did Writing Become a Popularity Contest? I love your writing… that is all. I still use those spiral notebooks to get me started on a writing project. In fact, I was just about ready to take one to the couch to begin a couple of blog posts for next week. Great post! 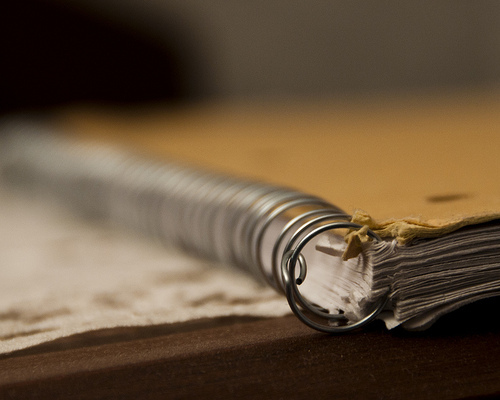 Glad to hear that some writers still use the spiral notebook! And sharpened #2 pencils. I’m just one step advanced from chisel and stone. The Artist’s Way changed my life entirely. My many spiral notebooks are around here somewhere. Great blog!